First time director Leigh Janiak has made herself a tight little indie horror film. 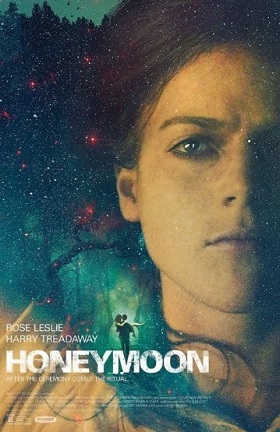 Debuting earlier this year at SXSW, ‘Honeymoon’ features Rose Leslie (Game of Thrones) and Harry Treadaway leading a familiar, ‘cabin in the woods’ set up. The beginning ambles along with a fair amount of treacle from the writing, the talent and experience of the cast members being the only thing keeping it engaging. The picture does shift gears though and the director has a nice bit of fun building the tension. Mixing a healthy portion of the creepy impregnation themes from ‘Rosemary’s Baby’ with and equal part of ‘Persona’s’ sense of isolation, ‘Honeymoon’ delivers real tension and makes great use of spaces and lighting. The film makes a nice, clean break from the tired ‘found footage’ laziness that has been the staple of the horror genre of late. While the underlying mystery of the plot line is not well disguised, the mood of the picture carries it easily. Rose Leslie shines, without betraying a hint of her Scottish accent, bringing a strong presence to the screen. Harry Treadaway puts on some vulnerable performances, with depth and patience, providing a nice counter to Leslie. The nature of creating drama in a closed, limited space provides a nice showcase for the talent making the film. Here, Janiak has created a credible film on what I can only imagine to be a shoestring, at least by most filmmaking standards. I, for one, am looking forward to her next film, whatever it may be.